Termites construct termite tubes for shelter as they travel between their underground colonies and the structure. To help determine if an infestation is active, Lady Bug Eco-Friendly Pest Control breaks open the tubes and checks for the presence of small, creamy-white worker termites. 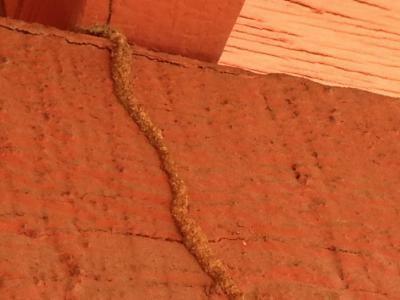 If a tube happens to be vacant, it does not necessarily mean that the infestation is inactive; termites often abandon sections of tube while foraging elsewhere in the structure. Termite-damaged wood is usually hollowed out along the grain, with bits of dried mud or soil lining the feeding galleries. Wood damaged by moisture or other types of insects will not have this appearance. Occasionally termites bore tiny holes through plaster or drywall, accompanied by bits of soil around the margin. Rippled or sunken traces behind wall coverings can also be indicative of termites tunneling underneath. Oftentimes there will be no visible indication that the home is infested. Termites are cryptic creatures and infestations can go undetected for years, hidden behind walls, floor coverings, insulation, and other obstructions. Termite feeding and damage can even progress undetected in wood that is exposed because the outer surface is usually left intact. It is important to protect your home from these pests. Call Lady Bug for a Free Termite Inspection, Eco-Friendly Pest Control, Home Seal Service, Bed Bug Eco-Heat, and Rodent Control. We offer FREE Home Inspections. 480-833-1111.